EXCLUSIVE to Grand Challenger the 2016 Model is a stylish contemporary design that’s easy-to-use – simply roll it out when you need it + fold it away when you’re done. 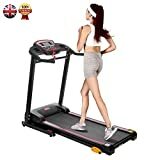 The practical design features + affordable price makes it superior to similar treadmills on the market. Monitor your speed, time distance, calories + heart rate at the touch of a button. Select from 3 Quick Start buttons or choose one of the 10 pre-set programs to get you moving. Increase the intensity of your workout + achieve your fitness goals faster by adding incline to your workout. Going from zero-incline to 7 % burns over 100 calories more during a 30 minute session. The extra-wide running surface gives you the space + confidence you need to exercise comfortably. The innovative GROOVE belt is not only semi-commercial grade but is also designed to reduce bounce offering superior cushioning + grip to make it more comfortable + easier on your joints. Simply roll it out when you need it + fold it away when youíre done. The gaslever are designed to keep it secure + safe from falling over when stored in an upright position.